Field journals and free DLC makes the Modern Warfare 3 Hardened Edition surprisingly good value. If you're thinking about shelling out for the Hardened Edition of Modern Warfare 3, you're probably quite interested in finding out what's actually in it. Well, you would seem to be in luck, as a leaked photo has revealed exactly what you're getting for your money. As well as a Steelbook case and a collectible field journal, it includes a full year's membership to Call of Duty Elite, which in turn grants access to future Modern Warfare 3 DLC. Players also get "Founder Status" on the service, which gives various in-game benefits, like exclusive emblems and camouflage, and perhaps most useful, bonus clan XP. There's also a special outfit for your Xbox 360 avatar, or an "animated timeline" theme for the PS3. As you can see, the image looks pretty genuine, but it's worth mentioning that the image shows the UK version of the game, so it might be different in other territories. It's probably not going to be all that different though, if it's actually different at all. 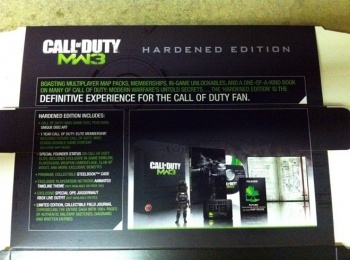 Undoubtedly, we'll learn more about the Hardened Edition at the Call of Duty XP convention, which starts tomorrow.